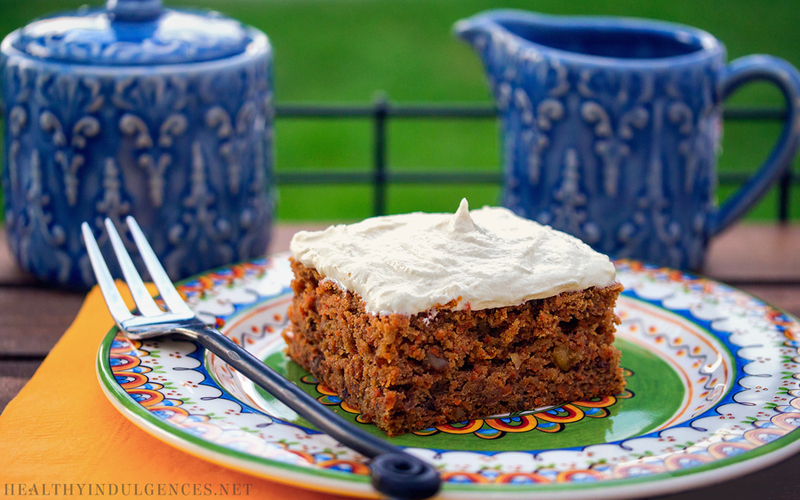 -I left xanthan gum out of this new carrot cake recipe due to some recent studies on thickeners that have me concerned about gum consumption. Without the binding power of xanthan, this cake is a bit more crumbly when cutting and serving. To solve this dilemma, chill the cake before cutting it into pieces. Also, chop the walnuts very finely before adding them to the batter. Finally, if you bake the cake in a square pan it should cut the most cleanly. The round cake layers, although beautiful, are a bit messier to deal with! -The small amount of gluten-free oat flour in this cake makes it much more cake-like compared to recipes with 100% coconut flour. To make this cake grain-free and paleo, you can replace the oat flour with 1/2 cup of arrowroot starch. Because I tailor these recipes for people with diabetes, I try to minimize the use of refined starches like arrowroot and tapioca flour. Oat flour has fewer carbs and more fiber than refined starches, so it has a permanent position in my lower carbohydrate flour arsenal. Another reason I prefer oat flour is because oats are a grain with anti-inflammatory properties. -If you are using the old NuNaturals stevia (produced prior to 2013), be sure to use 1/2 the amount of stevia listed in the recipe. -If you’d like to make a four layer cake as shown in the photos, double the ingredients and bake the cake in 4 separate, 8 inch (20.32 cm) cake pans on 2 racks placed in the middle of the oven. Half way through the baking process, switch the cakes to the other racks to be sure they cook evenly. -For a dairy-free cake, use melted ghee or melted coconut oil in place of butter. My dairy-free, Sugar-Free Buttercream works very well in place of the cream cheese frosting! -This recipe is Trim Healthy Mama and Wheat Belly compliant. If you’re sugar-free, you’ll love this cake made with a blend of herbal sweeteners (stevia and erythritol) which tastes just like your old favorite! If you eat sugar, feel free to substitute 1 cup of pure cane sugar for the sweeteners listed. 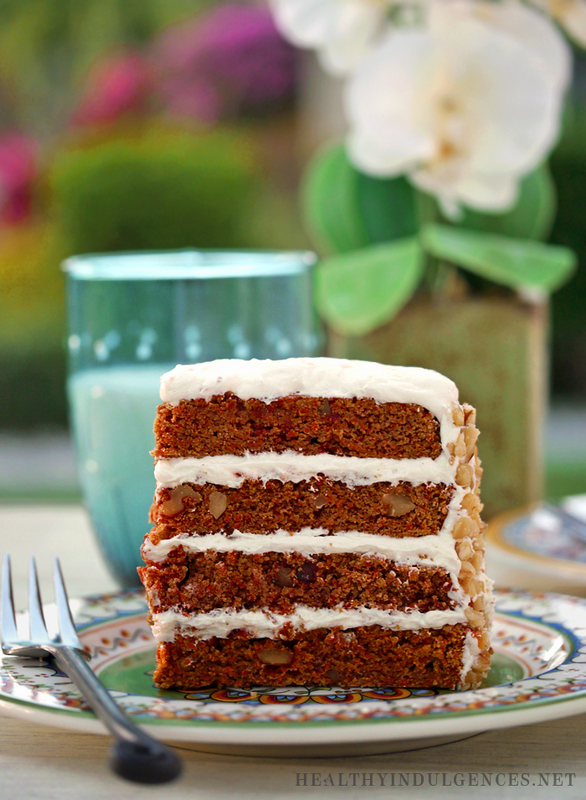 Whatever sweetener you choose, the mingling of carrots and spicy cinnamon will delight your senses! Grease 2-9 inch round cake pan, or 16 cupcake liners, or 1 8-inch square pan with grapeseed oil cooking spray or melted butter. Sift a little oat flour on the inside of the cake pan to ensure that the cake comes out easily. Wash peel, and grate carrots. Be sure to use a grater with fine holes so that the carrot shreds are small enough to cook through! Place carrots shreds in a tea towel, and fold tea towel on itself into layers. With clean hands (or clean feet!) wring or step on tea towel to extract moisture from the carrot shreds.I like to dance on top of the tea towel to get in a quick workout! Set aside carrot shreds. Using a hand blender, beat together butter, sweetener blend, and xylitol for 2-3 minutes, or until butter is light and fluffy. Scrape around edges of blender bowl with spatula. In a separate mixing bowl, whisk together dry ingredients (excluding the carrots). Crack your 4 eggs into a glass measuring cup. Turn on hand mixer and start alternating between beating in the eggs and dry ingredients. Mix in an egg, then mix in a little bit of the dry ingredients. Keep adding eggs and dry ingredients until batter is just beaten together, smooth and free of lumps. Beat in carrots, vinegar, and baking soda. Scrape into 2 cake pans, smoothing the top of the batter with your spatula. Gently rap cake pans on a towel lined counter to pop any air bubbles in the batter. Bake cake pans on the middle rack for 30 minutes, or until a toothpick inserted into the center comes out clean. Cool the cakes for 10 minutes. Run a skinny knife around the edges, then invert cakes onto a cutting board or cookie sheet. Frost with Sugar-Free Cream Cheese Frosting and stack layers. Store in fridge, wrapped in plastic wrap for up to one week (if it lasts that long!). Per Serving: 216 Calories; 17g Fat; 5g Protein; 11g Carbohydrate; 4g Dietary Fiber; 106mg Cholesterol; 148mg Sodium. 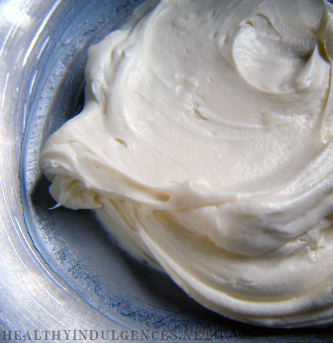 Here’s my fluffy, Sugar-Free Cream Cheese Frosting recipe. The secret ingredient that takes the place of sugar and makes it so fluffy is coconut milk powder! Check your local Target or Asian grocery store to find the packets. This post has much more info about this magical, frosting-enhancing ingredient! This fluffy, sugar-free cream cheese frosting recipe has a secret ingredient: Coconut milk powder! It’s available in grocery stores and Asian markets. You can leave it out, but it makes the frosting so rich and silky that you’d be missing out if you did! Leave cream cheese and butter out on counter to come to room temperature. Add butter with knife (doesn’t have to be exact) and add to bowl along with cream cheese. Beat together with a hand mixer until smooth and fluffy. Add in powdered sweeteners and vanilla. Beat until smooth and fluffy (30 seconds to one minute), until sweeteners are dissolved and no longer gritty feeling. 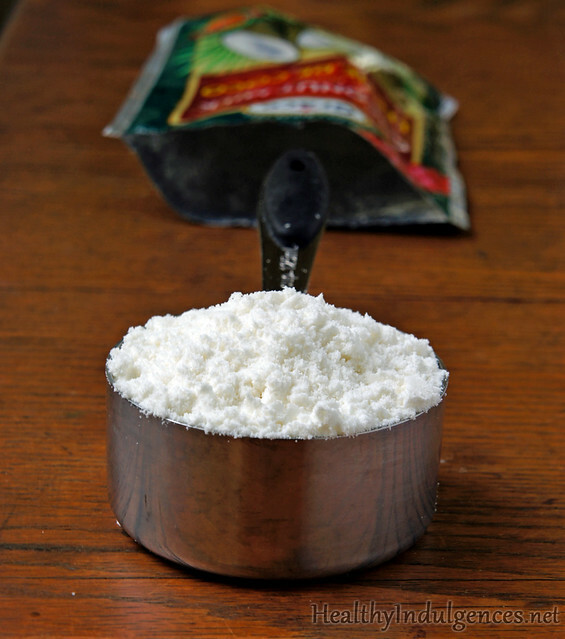 Beat in coconut milk powder. Taste, and add more sweetener if necessary. Use immediately, or store in a plasticware container for up to 1 week. *The small amount of xylitol helps the frosting from becoming gritty, but you can leave it out and still have a tasty batch! You’ve outdone yourself again! Love the idea of the coconut milk powder as a frosting enhancer. I keep it int he pantry but haven’t used it this way. Can’t wait to try this cake and frosting. Peggy, I just saw your comment! Thanks for the kind words. The coconut milk powder really fluffs up the frosting nicely! Hope you enjoy the cake. It’s great to hear from you again! Sailu, hope you and your niece enjoy the cake! hey there! thanks for the recipe, I am making it today, I just don’t know when to stir the vanilla and yogur in, I put them together with the eggs. Is that right? This looks amazing and I would like to make for an upcoming brunch party. Please can you clarify the sizes of the pans – is it correct that this will fill either 2 9-inch round pans or 1 8-inch square? I would have thought there wouldn’t be enough for 2 round pans. I also wondered if the nutritional information for the cake includes the frosting or not? Thanks! Thanks for your comment, Joanna. The batter fills 2 8 inch cake pans. The layers are thin, but they still bake up nicely. Hi, thank you for this delicious recipe. Can I use agave only as the sweetener? Amazing cakes but what makes it really special is the atmosphere.